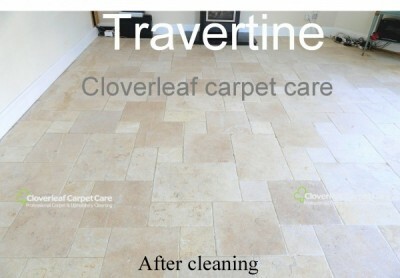 Limestone and Travertine floor cleaning maintenance and sealing service in Mid Cheshire. If your Limestone or Travertine floor needs cleaning in Cheshire your in the right place. If your floor has become difficult to clean through normal mopping and cleaning, it’s probably time to have it professionally cleaned to bring back the original appearance. Travertine Floors can be cleaned and brought back to life. 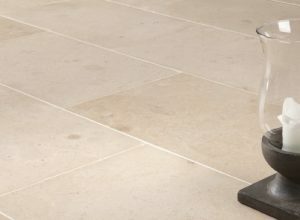 Travertine floor tiles can come in several shades of beige, a lighter cream colour or darker shades. Additionaly vein patterns from fossil plants and holes created from gas bubbles during the rocks formation can often be evident on the surface. Because Travertine stone is porous, it will readily attract dirt and grease soiling caused by foot traffic from outside. Where homes with animals such as dogs are kept, the soiling may be more apparent. Periodic professional maintenance and machine cleaning should keep your floor in as new condition. 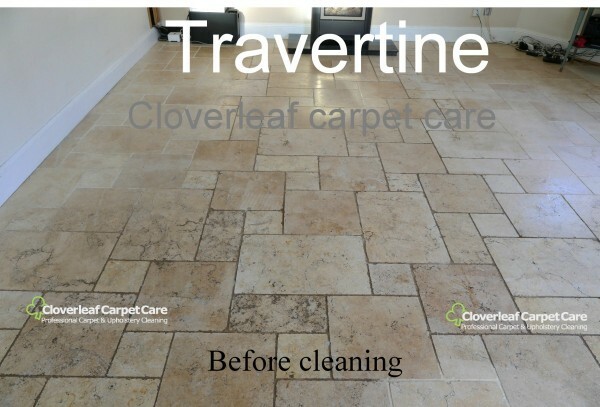 The areas we cover for Limestone and Travertine floor cleaning include: Alderley Edge, Altrincham, Crewe, Nantwich, Frodsham, Hale, Holmes Chapel, Knutsford, Lymm, Middlewich, Northwich, Sandbach, Tarporley, Warrington, Winsford, and Wilmslow. Limestone floor tiles are very similar to Travertine but this type of stone is denser, smoother, somewhat softer and less porous. This type of rock flooring also comes in varying shades and surface textures. Additionally the edges can be straight and sometimes scalloped where they fit next to the grout. Similarly this type of tile will require cleaning at periodic intervals to keep it looking bright and clean. 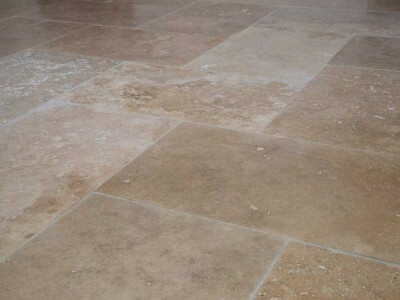 Watch a short video about how Travertine or Limestone floors can be cleaned in Cheshire. The video to the right shows a typical example of a floor being machine cleaned. This process also cleans deep into the grout and the floor looked as clean and bright as the day it was laid! The photo opposite is of a Travertine floor that needed cleaning in Knutsford Cheshire which consisted of a sitting and kitchen area. This is a large family room with a lot of traffic including the lovely and playful large dog. As can be seen from the image, the floor was very soiled and had lost it’s appearance after many years of use and could not be improved by mopping. The grout had also turned black. The Travertine floor was then treated with a strong cleaning solution to release the dirt and grime. The floor tiles were then cleaned with a machine and a mild abrasive to remove not only the dirt but also a fine amount of stone from the surface to reveal a fresh and as new floor. The grout or gaps between the tiles were also brought back to their original white condition. The floor was then sealed to help prevent stains from both oil a nd water based spillages. Needless to say the customer was delighted at having a fresh and as new floor! 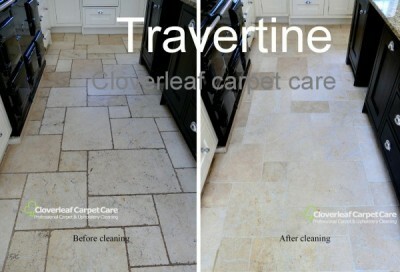 An image from the kitchen area before and after cleaning of the Travertine floor. You can either give us a call, email or use the call back request on the contact page. We can visit your property to ascertain your requirements and in some circumstances do a test patch area to give you an idea of the results that can be obtained without obligation. We can then leave you with a no obligation quote which we can email you along with our current copy of insurance details.